Marriage licenses are issued at the Gonzales Worthey Rd. and Donaldsonville Offices. 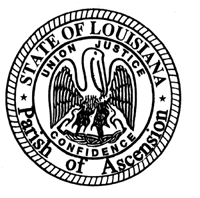 The license is valid in any parish in the State of Louisiana. Application for a marriage license may be made by either party; only one party needs to be present, but must present all required documents for both parties. Applicants must provide a valid and unexpired driver’s license, government issued ID or un-expired passport. Due to the processing time of the application, please arrive at our office no later than 4:00 p.m.
CLICK HERE TO FILL OUT AN ONLINE APPLICATION WORKSHEET. Applicants must be 18 years of age. If an applicant is 16 or 17 years of age, both parents must appear with photo identification to sign a consent form. If under the age of 16, in addition to parents written consent, you must have written consent from a judge. Applicants must present an original or certified copy of their birth records. If either party was born outside the United States he/she must present the original birth certificate. If the birth certificate is not in English, applicant(s) must also provide a notarized translation that includes a sworn declaration of translator. Certificates of Naturalization can also be accepted in place of a birth certificate. If a birth certificate cannot be provided the applicant shall obtain an order signed by a judge waiving the birth certificate requirement. Applicants must provide both Social Security numbers. If no number has been issued, that person must appear in person and sign a statement to that effect. If either applicant has been previously married, applicant must state the number of previous marriages and provide a certified copy of the final judgment of divorce, or if the former spouse is deceased, a dated copy of the death certificate. Applicants must obtain the marriage license 1 day (24 hours) prior to the ceremony. This can be waived by a judge or justice of the peace authorized to perform the ceremony. A marriage license is valid for 30 days from the date of issuance. A Covenant Marriage requires the same information stated above in addition to premarital counseling. Applicants wanting to obtain a Covenant Marriage must submit a declaration of intent and affidavit and attestation. The following information for both parties is also required: Highest grade of education completed; father’s full name and state of birth; mother’s full name (Maiden Name) and state of birth. The fee for obtaining a marriage license is $35.00; covenant marriages are an additional $10.00. This fee includes a certified copy of your marriage license to be mailed back to you after your ceremony. ALL FEES ARE NON-REFUNDABLE.